Today we're chatting with Amy Losak, Chad Reynolds and Alexis Orgera about Penny Candy Books and the posthumous publication of Amy's mother's poetry as a picture book, H is for Haiku: A Treasury of Haiku from A to Z by Sydell Rosenberg, illustrated by Sawsan Chalabi (Penny Candy Books, 2018). Inspired by her experiences living in New York City, Sydell Rosenberg's haiku invite children and their parents to slow down, linger, and pay attention to the moments we often overlook. Tell us about H is For Haiku, and its author, Sydell Rosenberg. 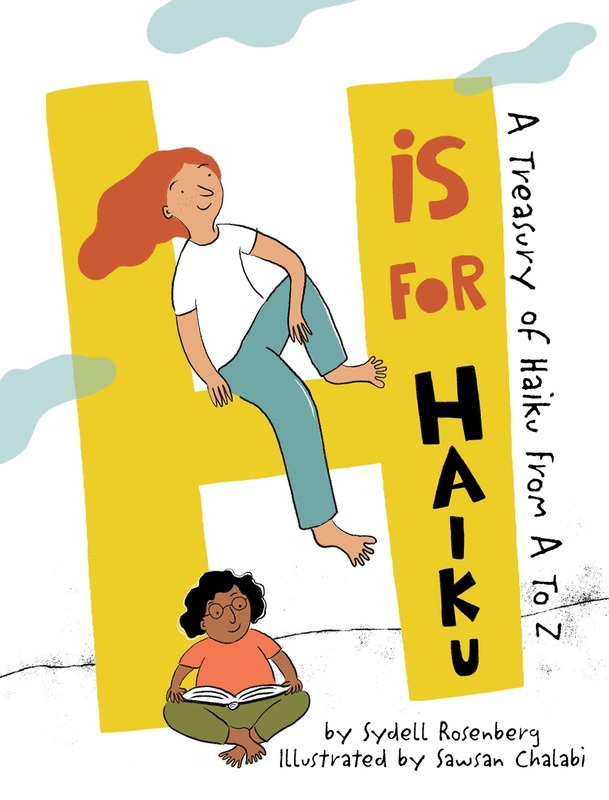 H Is For Haiku: A Treasury of Haiku From A to Z, is a collection of short poems – called haiku and senryu – for kids that celebrates the small moments in our everyday lives we may tend to overlook. This book is organized as an alphabet reader. 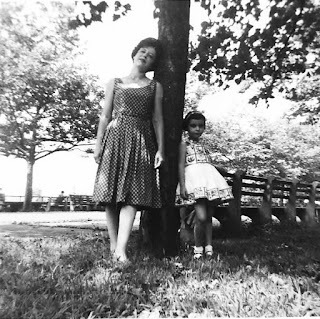 Sydell Rosenberg, my mother, was a New York City teacher and writer. She wrote poetry, prose, word and literary puzzles, and more. Mom was a charter member of the Haiku Society of America, which turns 50 years old this year. Penny Candy Books released H Is For Haiku in April – National Poetry Month. The clever and vibrant illustrations are by Sawsan Chalabi. Some of the short poems in this book were first published in journals and other outlets years ago, and they remain fresh and fun today. I did my homework before I started to approach publishers. I first debated whether or not to self-publish or seek out an agent – or else a publisher directly. There are benefits and drawbacks to all these paths, and I considered the merits of each one. Eventually, I decided to try for a publisher, and I looked for ones that didn’t require agent representation and might have an interest in simple but striking poetry that are almost like stories in miniature. Thanks to my ongoing research and the gracious and welcoming children's literature and poetry communities, which are so generous with sharing helpful information, I was able to submit to quite a number of publishers. I have lost count of how many I pitched Mom’s manuscript to. I’m sure I submitted over-the-transom to at least 15 or so, if not more. I began submitting H Is For Haiku around April 1 of 2015 (no fooling!). Penny Candy Books and I connected in 2016. And the book came out this past April … so this process took about three years, from start to finish. Once you connected with a publisher, what was the editing process like? How did you choose which poems would be included in the book? How were revisions handled? Overall, the editing process was quite smooth. I based the poems in H Is For Haiku on at least one of Syd’s old book manuscripts from decades ago. I did make a few substitutions and some revisions, but many if not most of the poems in her book are intact, as Syd wrote them. Now that the book is out, what steps have you been taking to make sure young poetry lovers know about it? H Is For Haiku has been a joyous – and yes, sometimes difficult – learning journey. Thanks to social media and again, the support of the children's literature and poetry communities, as well as family, friends, and colleagues, I’ve been able to spread the word, and the reception has been so welcoming and complimentary. I hope to do “Poetry Time” events for children at various venues, such as bookstores, libraries, and schools. 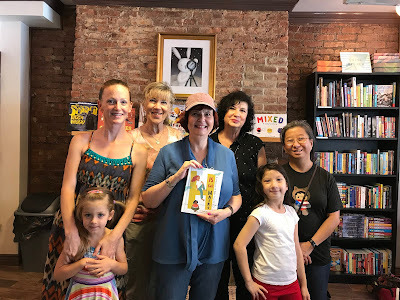 I recently appeared at a lovely independent bookstore in Queens, New York City (I grew up in Queens): Kew & Willow Books, and I enjoyed the experience immensely! 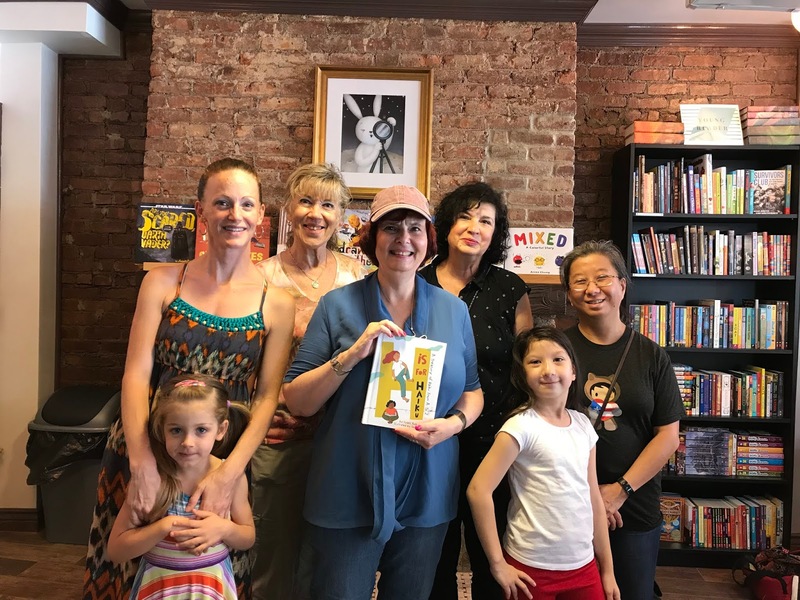 Amy (center) did a reading at Kew & Willow Books in the summer. Photo by Vina Castillo, Kew & Willow Books. I’ve interacted with young audiences several times in the past: for example, via a partnership with a wonderful nonprofit arts education organization in New York celebrating its 10th anniversary this year, Arts for All. Artists from AFA used Mom’s “word-picture” poetry to teach the basics of painting, drawing, and collage; music; and theater, and I had an opportunity to talk to students, mostly second graders in Queens and Bronx schools (but also other grades) about haiku and my mom. My main message has been that it pays to pay attention to the little glories all around us – and that, by observing with our senses, one can make a poem, such as a haiku, out of anything! For added perspective, I talked with the founders of Penny Candy Books, publishers Alexis Orgera and Chad Reynolds about the new press. Please tell us more about Penny Candy Books. Why did you decide to start your own publishing company? Alexis: We both wanted to contribute something good to the world, and neither of us really knew what path we wanted to take. Chad was working in the insurance industry; I was teaching college and working as a freelance editor. It took a chance cross-country trip, during which I stopped to see Chad – who was an old friend from grad school – and his family. We hatched a plan and haven't looked back! Chad: We knew we wanted our press to tackle big, important issues and to reflect a diversity of voices. Alexis: This isn't an easy business for small presses. A major challenge has been carving out a niche for ourselves while we build a business. Chad: It's been a steep learning curve for us. While Alexis and I had some experience in the industry, it was in different capacities. Learning the ins and outs of the children's book business has taken some time, and we still have a ways to go. Our impulse upon being told about "best practices" is to question what makes them so good. Sometimes this leads us to make our own best practices, and sometimes this leads us to adopting the status quo. The challenge is figuring which road to take. Another challenge is always having the money to fund all of our ambitions as we grow. How many books do you plan to publish each year? Alexis: We're looking about 8 to 10 a year for the next couple of years. Chad: With a longer term goal of doing between 20 and 24 new titles a year eventually. What is your manuscript selection process like? Are you a traditional, hybrid or vanity press? Alexis: We read unsolicited submissions, we solicit from writers we admire (poets, in particular), and we read submissions from agents. We are a traditional press. Chad: We are at the point where we receive a lot of submissions and it's hard to keep up. Alexis and I read each and every one. We've recently had to turn off our Submittable feed so that we could have time to get caught up. What kind of work is Penny Candy looking to acquire? Do you accept un-agented submissions? Alexis: We want poetic language coupled with good story. We want work by and about a diverse range of people. We want work that starts conversations without being didactic or preachy. Chad: We definitely do accept un-agented submissions (and we'll let everyone know when we open back up for submissions). Of the eleven books we've published so far, only two of the authors have been agented. For the five books in our Spring 2019 catalog, two of the authors were agented. What are some of your current or upcoming titles that you're particularly excited about? 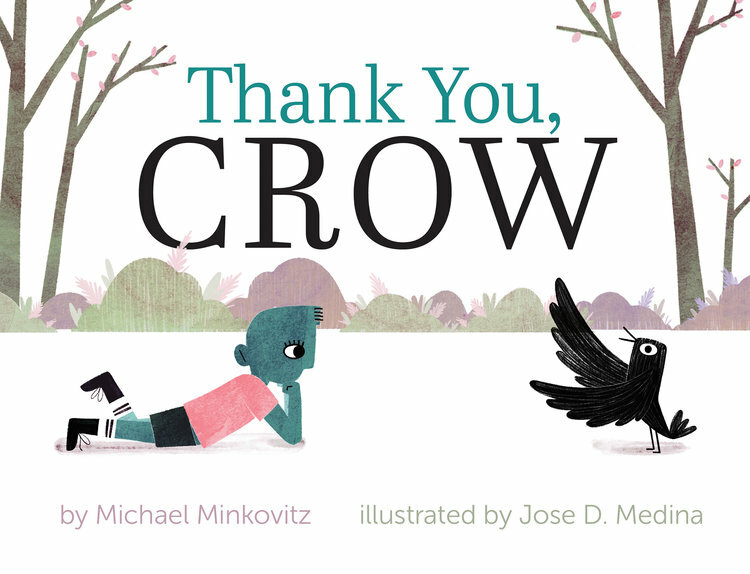 Alexis: We had a book called Thank You, Crow by Michael Minkovitz, illustrated by Jose D. Medina, come out in October that's about how one act of kindness can ignite friendship and adventure. 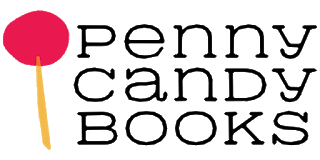 The main characters are Sebastian and Crow. It's such a sweet book. Chad: We are also very excited about the five books coming out in Spring 2019 as they each do a great job of sparking big conversations between kids and adults.